Pointing to Terry Crews as a blueprint for modern masculinity is a short path to self-loathing. He’s a sharp dresser. He’s handsome. He’s so muscular that his muscles appear to have their own muscles. Adding insult to injury, he’s funny, too! He’s almost determinedly un-serious, which only increases his appeal as an exemplar for manliness. Crews doesn’t need to associate with fart jokes, but he does it anyway, because he can. But the most important component of Crews’ persona is his vulnerability, that delicate quality so many guys blanch at expressing in public. It’s his openness, and not his body, that’s central to his performance as Sergeant Terry Jeffords on Brooklyn Nine-Nine, which last week returned for its sixth season (airing Thursdays on NBC, the show’s new home and savior from near-cancellation). Terry Crews challenges social perception of male weakness by talking openly about therapy and his sexual assault story. Terry Jeffords challenges those same perceptions by admitting aloud when he’s hit a dead end and isn’t sure where to go or what to do. That’s not weak. That’s admirable. Jeffords makes the 9-9 a better place by speaking the plain truth in “Honeymoon,” the season opener: Being the boss isn’t easy. “Honeymoon” sees the Sarge bluster with cheerful self-assurance, filling in for Holt while he’s on hiatus. He’s Top Dog Terry! He solves problems! He gets the job done! He doesn’t think twice about his decision-making skills, except when Rosa Diaz questions his ruling on her interdepartmental conundrums and his bravado falters. Suddenly he’s digging through Holt’s office, desperately looking for whatever guidance he can find to give him the confidence he needs to effectively lead. Confidence is core to “Honeymoon,” as well as this week’s episode, “Hitchcock and Scully.” In “Honeymoon,” Holt is rattled upon learning that he didn’t get the commissioner job after all, and even worse, that an old, petty, bigoted white guy did. In “Hitchcock and Scully,” we learn that once upon a time in the ’80s, the 9-9’s most slovenly detectives used to be studly hotshot cops, pulling off an undercover drug bust in the opening sequence. And of course there’s Terry in “Honeymoon,” leading with a cocksure smile but beset by self-doubt. No amount of bark can cover up his insecurity. The man’s just as rattled as Holt. In the margins of both “Honeymoon” and “Hitchcock and Scully,” Jake and Boyle dodge the bullet. Neither of them is forced to reckon with his manliness. In “Honeymoon,” Jake tries to be a good friend to Holt while making the most of Mexico with Amy. Boyle does Boyle things to get Gina to confess her part in their parents’ sudden divorce. In “Hitchcock and Scully,” Jake admits he’s too suspicious of others while Boyle admits he’s not suspicious enough. 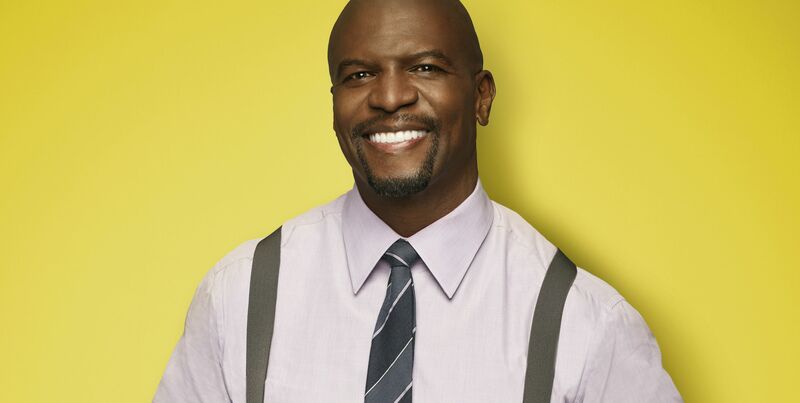 For Terry, it’s all about “Honeymoon.” This isn’t the first Brooklyn Nine-Nine episode in which Terry has reckoned with his personal anxiety; that’s been integral to his arc all the way back to the beginning of the series. The danger of police work and his natural excitability landed Terry on desk duty, but his fear of leaving his daughters without a dad kept him there. Fretting and worrying is in Terry’s DNA. It’s what he does. That’s not what we think of when we think of strong men, but it should be: He’s good enough to lead the 9-9 because he’s Terry Jeffords. Ultimately, like Holt, Hitchcock, and Scully, it’s strength of character that pulls Terry out of his funk rather than strength of arms. You don’t need to be a pro linebacker to build that kind of muscle.